The symbols inscribed on the cards tell us something about history, culture, and social relations. 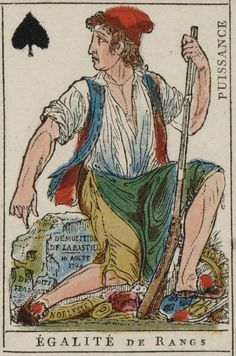 The “Revolutionnaires” deck of the French Revolution, also known as Jeu Prise de la Bastille, illustrates how ideology functions in popular culture. 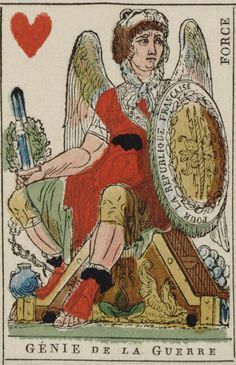 Designed by the French philosopher, the Count of Saint Simon, and produced by the French craftsmen Jaume and Dugoure in 1793, the Revolutionnaires deck creates ideological symbols intended to produce particular political meanings (Benjamin, 2002). They also represent how everyday objects, which often go unnoticed, can reinforce ideological beliefs in the larger cultural framework. As such, I will explore the historical and cultural contexts surrounding this deck of playing cards and discuss their symbolic, albeit rhetorical, nature. Ultimately, I will contend that this specific deck of cards is an example of how ideology functions rhetorically in an everyday, common item. The Revolutionnaries Playing Cards: Figures 1 - 13, below, depict the original playing cards with the name of the card at the bottom of the image. No one really knows when playing cards were first invented, but some scholars argue that they may have been invented in India, or perhaps Egypt (Benham, 1900/1957; Chatto, 1848; Goggin, 2006; Mayer, 1971; Meursius, 1622; Taylor, 1973). However, the majority of researchers argue that they probably began in thirteenth century China (Breitkopf, 1784; Figler, 2015; Hargrave, 1966; Lo, 2000; McLeod, 2000; McGuire, 2016; Singer, 1816). Some evidence suggests that the Chinese used paper to symbolize currency that were then used in games of chance. While drastically different than the playing card games that are familiar to us, the use of some sort of card stock for entertainment or gambling probably has its origins from this time period. Based on heavy trading with the Orient and/or due to the nomadic Roma people who were known to engage in cartomancy and fortune telling, playing cards traveled to Southern Europe. The playing cards to which we are more accustomed probably originated in Italy or Spain. We know from municipal records that the manufacturing of cards began around 1420 (Taylor, 1973), although the first known deck in Europe was in 1377 when a German monk wrote a letter in Latin referring to a deck of cards (Tilley, 1973). The suit monikers were largely consistent among the Italian and Spanish decks. They consisted of coins, cups, clubs, and swords (McGuire, 2016). 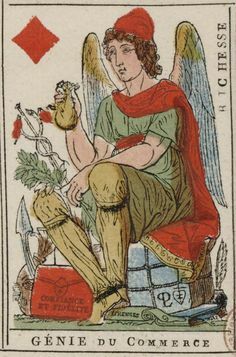 Additionally, Germany – who led in the early European card production – used the suits of hearts, bells, leaves, and acorns (McGuire, 2016). The French altered these suits by introducing the “spade, club, diamond, and heart suits which soon became the standard in England and then brought into British Colonies in America” (Figler, 2015; see also, Benefield, 2009). This morphology of suits is important for three reasons. First, the French version became more popular than the German suits, and they essentially are what is used today in a standard deck (Mann, 1966; Taylor, 1973). Second, the French suits symbolized war and the military, or as Goggin (2006) puts it, they were “emblazoned with monarchs and military themes.” Finally, the French version simplified the production process of playing cards by dividing the four suits into two red and black types. This made reproduction of cards easier and the production process much cheaper (Tilley, 1973). As a result, of course, this meant that the French style of playing cards became more affordable and accessible for peasants. Thus, French suits designate social class, and this historical development will be important when we examine the Revolutionnaires deck. 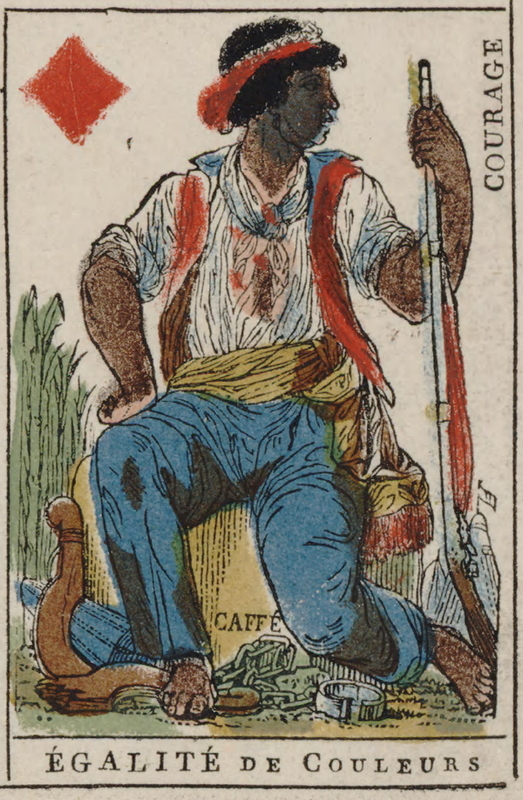 The original production of playing cards in France, like the rest of Europe, relied on a technique of painted wood cuts. The decks were hand-painted with decorative symbols, and they typically portrayed royalty. Hence, the use of kings, queens, and knaves began as a way of revering those in power (McGuire, 2016). Since the production of the card decks was so labor intensive, and not easily reproduced, they were very expensive. In fact, playing cards during this time were considered “popular luxury items” (Goggin, 2006). As a result, the aristocracy enjoyed playing cards, while peasants and the lower classes rarely witnessed their use, much less played with the cards themselves (Chatto, 1848; Singer, 1816; Taylor, 1973; Tilly, 1973). Over time, the technology of producing playing cards evolved. 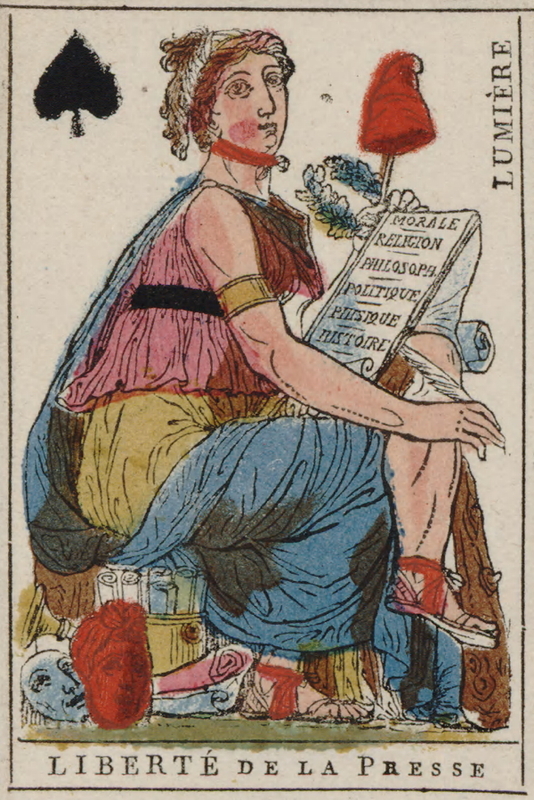 After the wood engravings, artists started using stencils for the card designations on wood, which made the “cards” more affordable (Singer, 1816). This made playing cards more popular, especially with the advent of easier methods of manufacturing. The evolution of stencils led to lithography and typography on layers of paste-board. In fact, at least one scholar claims that the creation of the printing press, and its famous reproduction of the Gutenberg Bible, may not have occurred without the technological advancement of paste-board productions of playing cards (Taylor, 1973). This brief historical sketch reveals how playing cards are highly symbolic. 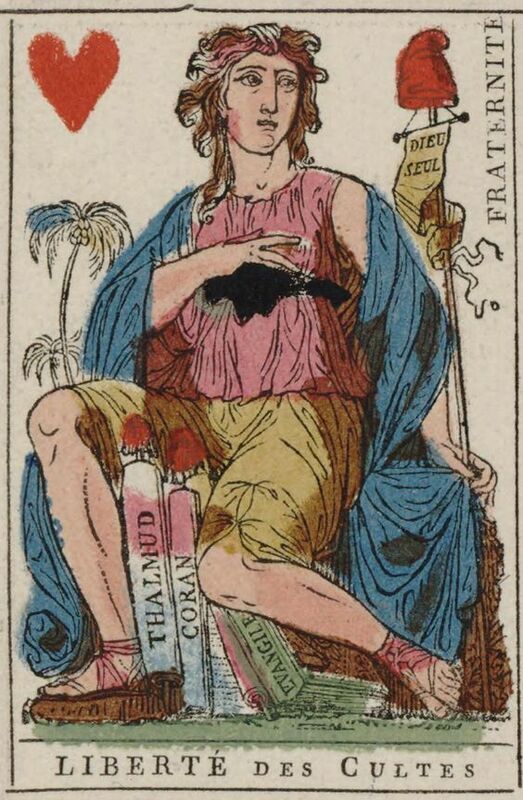 Cards culturally represent and signify what is perceived to be important during a particular historical conjuncture. To help us understand the symbolic significance of the French Revolution deck, we should note how symbols function, how they generate meaning, and how they can be interpreted. When we communicate, we use structures, grammatical rules, and a system of language; this is known as a code, or langue. Particular conversations and utterances are distinguished from langue, and they are known as parole. If we break down the communication process a bit more, we can begin to understand precisely how meaning is generated through our use of words, or ascribed signs. A sign, such as a simple word, is composed of two elements – the signifier and the signified. The signifier is the word or image used to refer to an object or feeling. The signified is the mental concept, or the cognitive processing that occurs during meaning formation and communicative exchange. As we develop agreement among members of our linguistic group by ascribing meaning through signs, the process is called signification. For instance, when I bring my four-legged, furry “daughter” to the veterinary clinic, I am greeted by a friendly office worker who asks me my dog’s name. This happens because in the English language, we have agreed that a specific type of four-legged, furry animals will be referred to as d-o-g, instead of calling them a boat, couch, or fork. Our cultural, linguistic community has come to agree what to call certain objects (and feelings, concepts, ideas, etc.). Without that agreement, we would not be able to communicate, as utterances literally would have no meaning. Thus, the sign – dog – is comprised by the signified – the four-legged, furry animal – and the signifier – the mental process whereby we associated the object with the utterance of its designation. Signs, then, form the fundamental basis for our words have meaning. In other words, “a sign is something that induces you to think about something other than itself – and everything has that potential …. Therefore, everything is a sign of something else. We might also say that everything is a signifier, that everything signifies something else, or that everything has signification. And signification – or the other thing that is signified – is just another way of referring to meaning” (Brummett, 2011, p. 7-8). These theoretical terms are important for us to understand the much more complicated process of meaning formation. I begin this discussion with the signifying function of words because they help us, in turn, to understand how non-verbal or visual signification occurs. A non-verbal gesture, or a visual sign, acts the same way as do words. Non-verbal gestures are also signs, and they are culturally determined just as words are. For example, raising a hand with the index and middle finger forming a “V” can be understood as victory, peace, rabbit ears, or a gesture of vulgarity. The different meanings will depend on the context and the culture. Visual communication operates similarly, as it is an extension of verbal and non-verbal signification. An image, such as a red, octagonal street sign, is a sign that is composed of the signifier – the actual red, octagon – and the signified – the cognitive association of that red octagon with the culturally agreed meaning “to stop.” Additionally, “words are not the only things with symbolic meaning. The particular pattern of red, white, and blue stars and stripes that you know as the flag of the United States means this country, symbolically, because the U.S. Congress has ordained it so, and people everywhere are agreed on this signification” (Brummett, 2011, p. 11). In other words, we must include visual representations in our rhetorical studies because the “use of the tools of rhetoric in analysis of visual representations has been intensified by the recognition that different visual symbols, representations, etc., allow for access to a wide spectrum of human experience that is unapproachable by the study of verbal discourse only,” which means non-verbal signs must also be investigated (Ventsel, 2014, p. 176). Since “people relate their lives to the conditions of their existence” through ideology, an everyday object – such as a flag or playing cards – can provide a signifying structure that produces ideological meaning so that citizens can make sense of their world (Barnard, 2001, p. 123). When we examine playing cards, we are observing 52 individual signs on pieces of pasteboard. Each card is distinct from the others due to its signifying markings. These markers have specific meanings. As a result, the different meanings allow us to use the cards for various games, gambling, or magic tricks. The designation of suits, face cards, and numbered cards provides meaning for an understanding of trumps and tricks in the game of Euchre, just as the same designations give meaning to straights, flushes, full houses, etc., in the game of poker. Without those signifying markers, and the agreed-upon meaning ascribed to them, these games could not occur and would not make sense to participants and observers. In terms of playing cards specifically, Vladimirovna looks at how cards are part of a sociolect of gamers, such that particular idioms form around play. She argues that “these international idioms have a metaphorical sub-cultural repertoire crossing with the literary norm in any language” (p. 257). The overall point to her essay is that playing cards generate a specific lexicon around their use. As important as this claim is, especially from a rhetorical perspective, it fails to study how the playing cards themselves are symbolic in nature, as opposed to the type of talk that is generative from their use. 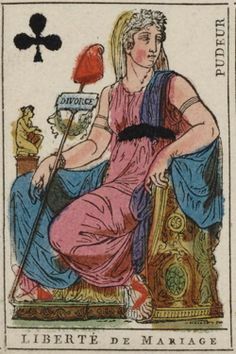 Interestingly, despite their common use and highly symbolic nature, not much has been written about the signifying meaning of cards. 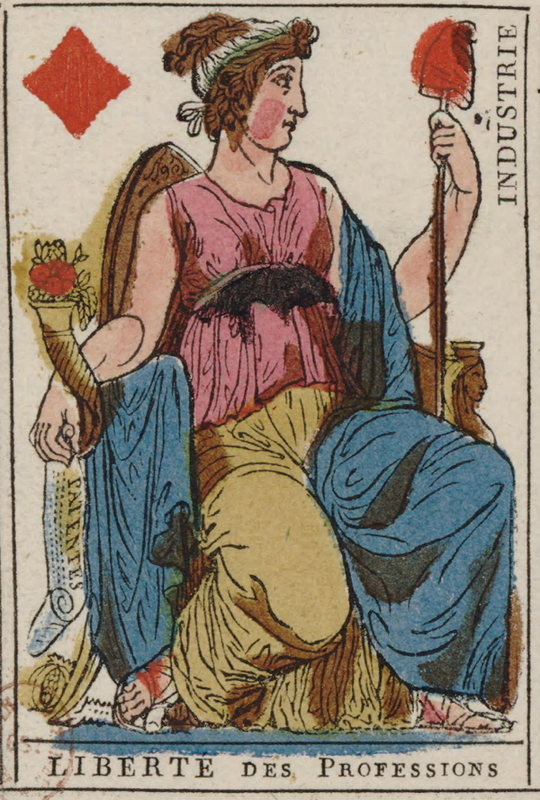 Of course, some authors have written about the history of playing cards, particularly the influence of the Tarot deck on the contemporary standard deck (Sadlon, 2007). 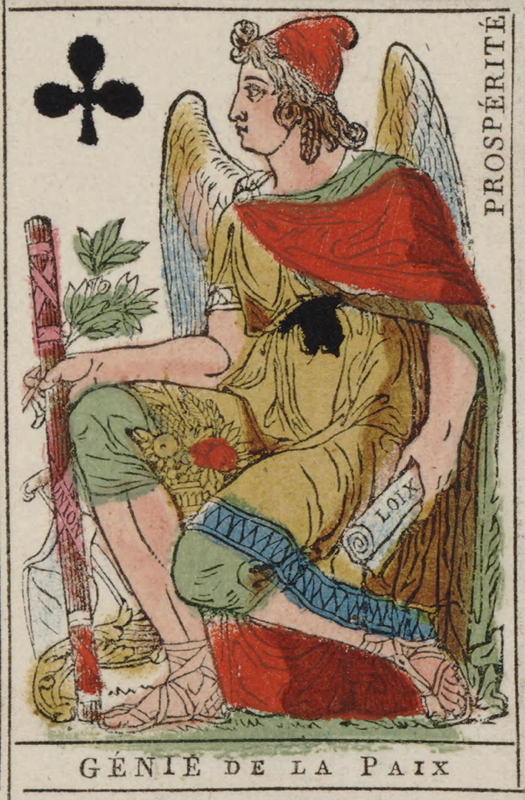 Although standard playing cards can be used for cartomancy, the Tarot deck is most often associated with fortune-telling. Interestingly, the relationship between cards and cartomancy reveals the linguistic power of playing cards. According to Thibault, the Tarot and other type decks are like “natural languages, cartomatic systems are socially and ethnically conditioned” (Thibault, 2015, p. 4). In other words, “cartomancy is indeed a language and is composed of two elements: a mechanism for the distribution of the cards, which generates sentences, and a vocabulary that explains the meaning of each card or idiomatic combination of cards” (Thibault, 2015, p. 3). 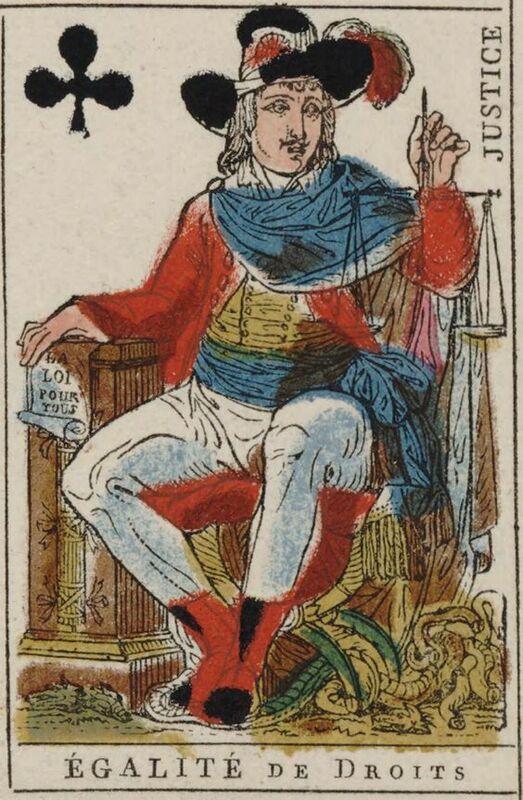 Similarly, historians who study playing cards will remind us that the four suits signify the four seasons of the year, the thirteen cards per suit represent the lunar months of the year, and when the numerical values of each suit is calculated, the total is 364 (Buchan, 1816). If we add the joker to the count, it becomes 365, thereby representing the number of days in a year. The 52 cards in the deck also signify the 52 weeks in a year, and the 13 cards in each suit “equal the thirteen lunar months in a year” (Southworth, 1941, p. 258). Additionally, the red and black colors may represent day and night (Southworth, 1941), or the “great division of the year into two equal parts, from solstice to solstice and equinox to equinox” (Buchan, 1816, p. 362). In this way, playing cards, as pieces of art, translate the symbolic value of art to our consciousness (Lotman, 2011). According to J. King van Rensselaer, cards were used by Egyptian priests to communicate with deities. As Goggin (2006) reports, “Among the Egyptian gods, Thoth is characterised as the great inventor. One of his many innovations is parchment, which legend has it, was used for transcribing the signs just referred to from the temple walls. Van Rensselaer and others have conjectured that the invention of parchment gave portability to this semiotic system, making it possible for priests to take the signs with them and to consult the gods outside temples to Thoth.” Additionally, “Over time, it was discovered that the leaves of Thoth’s books were more conveniently carried as a pack of unbound, loose tablets which could be manipulated with greater ease, and laid out and read as an augury” (Goggin, 2006). Thus, as the Roma brought such cards into Europe over generations, “these tablets would become playing cards,” such that the “pips on the suits are the last vestiges of the rods cast on the altar by the priests of Thoth” (Goggin, 2006; see also Taylor, 1973). Of course, these cards formed the beginnings of the Tarot deck. Play is a special kind of representation of a combination of regular and random processes. Thanks to the pronounced repeatability (regularity) of situations (rules of the game), any deviation becomes especially significant. At the same time, the base rules do not permit to predict all the “moves,” which appear as random in relation to the basic repetitions. This means that each element (move) has a double meaning, serving as a confirmation of a rule on one level and a deviation from it on another. The double (or multiple) meaning of the elements makes us perceive play-type models as highly significant…. (Lotman, 2011, p. 256). Amariglio, Jack & Bruce Norton (1991). Marxist Historians and the Question of Class in the French Revolution. History and Theory, 30(1), 37-55. Andress, David (2016, February). The French Revolution: A Complete History? History Today, 20-28. Aphek, Edna & Yishai Tobin (1989). Semiotics of Fortune Telling. Amsterdam: John Benjamins. Barnard, Malcolm (2001). Approaches to Understanding Visual Culture. Hampshire, UK: Palgrave. Benefield, T. Scott (2009). A (Brief!) History of Playing Cards. Available, http://www.oocities.org/timessquare/arcade/5257/history.htm (accessed 7/1/16). Benham, W. Gurney (1900/1957). Playing Cards: The History and Secrets of the Pack (5th ed.). London: Spring Books. Benjamin, Walter (2002). The Arcades Project (Howard Eiland & Kevin McLaughlin, Trans.). Cambridge, MA: Belknap Press. Breitkopf, Von J. G. L. (1784). Versuch, den Ursprung der Spielkarten, die Einführung des Leinenpapieres, und den Anfang der Holzschneidekunst in Europa zu Erforschen. Leipzig. Brummett, Barry (2011). Rhetoric in Popular Culture (3rd ed.). Thousand Oaks, CA: Sage. Buchan, Alex P. (1812). A Conjecture Concerning the Origin of Playing Cards and the Game of Whist. In Samuel Weller Singer, Researches into the History of Playing Cards with Illustrations of the Origin of Printing and Engraving on Wood (1816, pp. 361-363). London: T. Bensley and Son. Carson, Marian S. (2016). Curiosities for the Ingenious: Selected from the Most Authentic Treasures of Nature, Science and Art, Biography, History, and General Literature. Palala Press. Censer, Jack R. & Lynn Hunt (2001). Liberty, Equality, Fraternity: Exploring the French Revolution. University Park, PA: Pennsylvania State University Press. Chatto, William Andrew (1848). Facts and Speculations on the Origin and History of Playing Cards. London: John Russell Smith. Cichoski, Bill, Angela Rice, Philip Greenan, & Elisa Visick (2010, April 1). Symbols of the French Revolution. FHSS Mentored Research Conference, Brigham Young University. Available, http://scholarsarchive.byu.edu/cgi/viewcontent.cgi?article=1130&context=fhssconference_studentpub (accessed 7/15/16). Dugoure, Jean-Démosthène (1793). Nouvelles Cartes de la Republique Franҫaise (Urbain Jaume & Jaume et Dugoure, Eds.). Paris: Jaume & Dugoure. Elster, Jon (2003). Alchemies of the Mind: Rationality and the Emotions. Cambridge, UK: Cambridge University Press. Figler, Jeff (2015, November). The 52-Card Playing Deck. The Antique Shoppe, 26. Frey, Linda S. and Marsha L. Frey (2004). The French Revolution. Westport, CT: Greenwood. Furet, Franҫois (1978). Interpreting the French Revolution (Elborg Forster, Trans.). Paris: Cambridge University Press. Goggin, Joyce (2006). The Playing Card’s Progress: A Brief History of Cards and Card Games. Reconstruction: Studies in Contemporary Culture, 6(1). Available: http://reconstruction.eserver.org/Issues/061/goggin.shtml. Hargrave, Catherine Perry (1966). A History of Playing Cards and a Bibliography of Cards and Gaming. New York: Dover. Hatcher, Jeannette (2013, July). The Fascinating World of Playing Cards. Haslemere Herald. Available, http://www.haslemeredfas.org.uk/articles/JHatcherHH2.pdf (accessed 7/1/16). Henry, Robert (1800). The History of Great Britain from the First Invasion of It by the Romans under Julius Caesar (3rd ed.). London: A. Straham. Kropotkin, Pëtr (1909). The Great French Revolution 1789-1793 (N. F. Dryhurst, Trans.). New York: Vanguard Printings. Lanning, Katie and Theresa Kelley (2013). A Gallery of Rousseaus. University of Wisconsin Center for the Humanities. Available, http://humanities.wisc.edu/assets/misc/Rousseau_Gallery_Descriptions.pdf (accessed 7/1/16). Lefebvre, Georges (1958). Remarks on Robespierre (Beatrice F. Hyslop, Trans.). French Historical Studies, 1(1), 7-10. Lefebvre, Georges (1967). The Coming of the French Revolution (R. R. Palmer, Trans.). Princeton: Princeton University Press. Linton, Marisa (2006). Robespierre and the Terror. History Today, 56(8). Available, http://www.historytoday.com/marisa-linton/robespierre-and-terror (accessed 7/1/16). Llewellyn, Jennifer & Steve Thompson (2015). The Third Estate. Alpha History. Available, http://alphahistory.com/frenchrevolution/third-estate/ (accessed 7/1/16). Lo, Andrew (2000). The Game of Leaves: An Inquiry into the Origin of Chinese Playing Cards. Bulletin of the School of Oriental and African Studies, 63(3), 389-406. Lotman, Juri (2011). The Place of Art among Other Modelling Systems. Sign Systems Studies, 39(2/4), 249-270. Mann, Sylvia (1966). Collecting Playing Cards. New York: Crown. Mayer, Leo Aryeh (1971). Mamluk Playing Cards. In R. Kurz & O. Kurz (Eds. ), Ettinghausen. Leiden, The Netherlands: E.J. Brill. McBride, Theresa (1992). Public Authority and Private Lives: Divorce after the French Revolution. French Historical Studies, 17(3), 747-768. McGuire, Pauly (2016). History of Playing Cards. Club Poker. Available, http://en.clubpoker.net/history-of-playing-cards/p-26 (accessed 7/1/16). McLeod, John (2000, June 8). History of Playing-Cards. The International Playing-Card Society. Available, http://i-p-c-s.org/history.html (accessed 7/15/16). Meursius (1622). De Ludis Graecorum. Lugduni Batavorum. Morley, H. T. (1989). Old and Curious Playing Cards: Their History and Types from many Countries and Periods. Secaucus, NJ: The Wellfleet Press. OLL (2016, April 13). 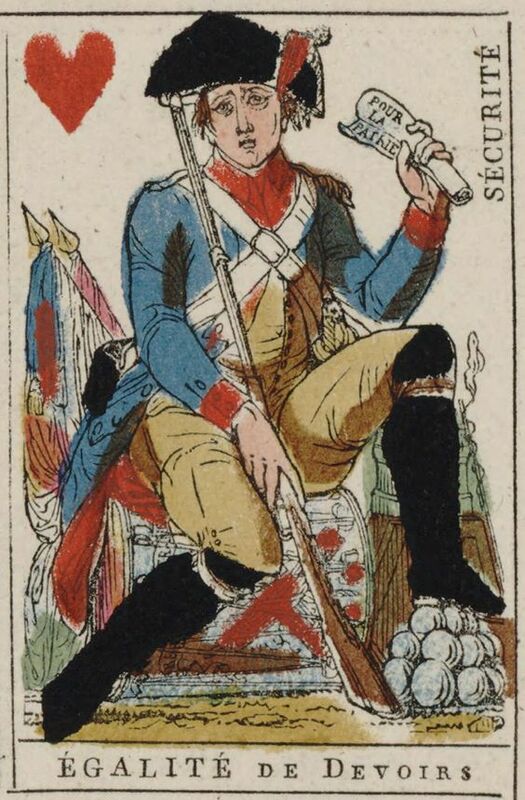 New Playing Cards for the French Republic (1793-1794). Online Library of Liberty: A Collection of Scholarly Works about Individual Liberty and Free Markets. 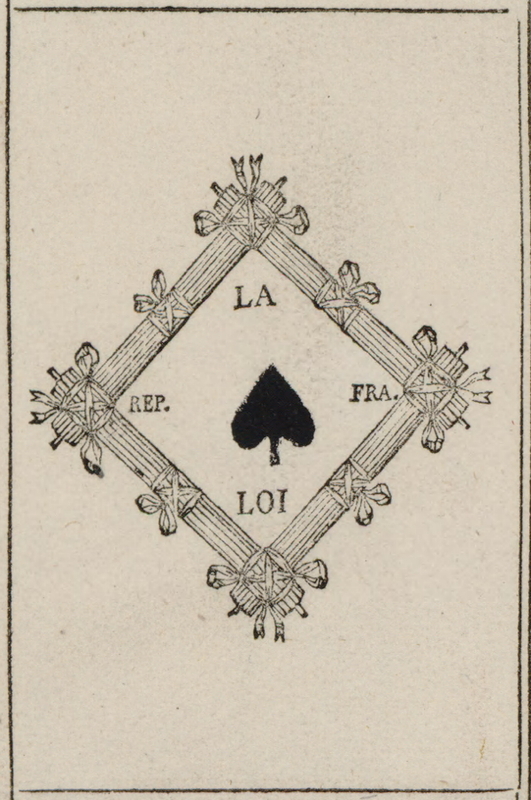 Available: http://oll.libertyfund.org/pages/new-playing-cards-for-the-french-republic-1793-94 (accessed 7/15/16). Phillips, Roderick (1980). Family Breakdown in Eighteenth-Century France: Rouen, 1780-1800. Oxford: Oxford University Press. Place, Robert Michael (2005). 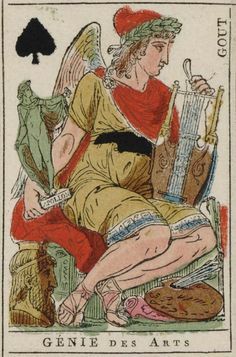 The Tarot: History, Symbolism, and Divination. New York: Teacher Perigee. Proulx, Travis & Brenda Major (2013). A Raw Deal: Heightened Liberalism Following Exposure to Anomalous Playing Cards. Journal of Social Issues, 69(3), 455-472. Sadlon, Peter (2007). Francesco Petrarch & Laura de Noves. Available, http://petrarch.petersadlon.com/tarot.html (accessed 7/1/16). Singer, Samuel Weller (1816). Researches into the History of Playing Cards: With Illustrations of the Origin of Printing and Engraving on Wood. London: Bensley and Son. Southey, Robert (1814/1876). Common-Place Book. London: Reeves-Turner. Southworth, Luther (1941, May). Your Deck of Cards. The Linking Ring, 21(3), 257-258. Tarrow, Sidney (2011). “Red of Tooth and Claw”: The French Revolution and the Political Process – Then and Now. French Politics, Culture & Society, 29(1), 93-110. Taylor, Edward S. (Ed.) (1973). The History of Playing Cards with Anecdotes of Their Use in Conjuring, Fortune-Telling and Card-Sharping. Tokyo: Charles E. Tuttle Company. Thibault, Mattia (2015). Semiotics and Cartomancy: Tartu-Moscow Semiotic School Legacy. KOME – An International Journal of Pure Communication Inquiry, 3(2), 1-9. Threadgold, Terry (1986). Semiotics-Ideology-Language. Sydney Studies in Society and Culture, 3, 15-60. Tilley, Roger (1973). Playing Cards. London: Octopus Books. Treadwell, Lawrence (2015). The Real Meaning of the French Revolution. The Cave. Available, http://thecaveonline.com/APEH/meaningfrrev.html (accessed 7/1/16). van Rensselaer, Mrs. John King (1912). Prophetical, Educational, and Playing Cards. London: Hurst and Blackett. Ventsel, Andreas (2014). Hegemonic Signification from Perspective of Visual Rhetoric. Semiotica, 199, 175-192. Vladimirovna, Sabirova Lyudmila (2015). The Socio-Subcultural Phenomenon of a Peculiar Sociolect in Playing Card Nomination. Science Time, 21(9), 253-259. Vološinov, V. N. (1973). Marxism and the Philosophy of Language (Ladislav Matejka & I. R. Titunik, Trans.). Cambridge, MA: Harvard University Press. Webb, Jen (2009). Understanding Representation. London: Sage. Whiting, J. R. S. (1981, July). A Handful of History: Playing Cards in the Seventeenth and Eighteenth Centuries. History Today, 40-43. Willshire, William Hughes (1877). A Descriptive Catalogue of Playing and Other Cards in the British Museum. London: Elibron.